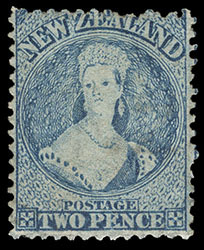 New Zealand, 1864, Queen Victoria "Chalon Head", 2d pale blue, perf 12½, N Z watermark, part o.g., nicely centered with perfs in at top, bright color, F.-V.F., Yeroc, J.M.A. Gregson, January 2000, lot 478. Scott No. 28B. Campbell Paterson No. A2j (W). SG No. 107 £475 ($620). New Zealand, 1864, Queen Victoria "Chalon Head", 2d blue, perf 12½, N Z watermark, horizontal strip of three, well centered with bright color, cancelled by two strikes of 1864 town cds, Very Fine and scarce strip. Scott No. 28B. Campbell Paterson No. A2j (W). SG No. 107 £225 as singles ($300). Joseph Hackmey, Spink Shreves, May 2010, part of lot 2336. Scott No. 29B. Campbell Paterson No. A5f (X). SG No. 108 £700 ($920). New Zealand, 1864, Queen Victoria "Chalon Head", 6d red brown, perf 12½, N Z watermark, lovely bright fresh shade, tied by "Picton" vertical-barred circle duplexed with "Picton, OC 12 64" cds on cover to Dartmouth, England, reverse with blue London transit and Dartmouth (12.23) arrival cds, Very Fine and choice use at the 6d rate to the U.K., Joseph Hackmey, Spink Shreves, February 2009, lot 1362. Scott No. 29B. Campbell Paterson No. A5f (X). SG No. 108 Estimate $300 - 400. 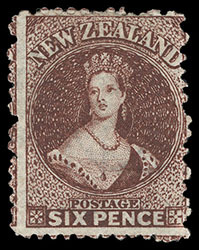 New Zealand, 1864, Queen Victoria "Chalon Head", 6d red brown, perf 12½, N Z watermark, strip of three, tied by two strikes of "Invercargill, Southland. N.Z. 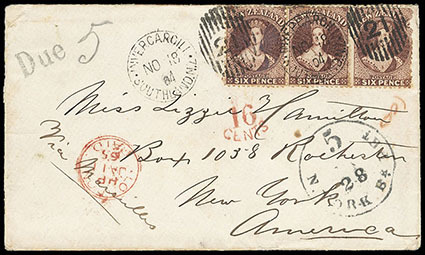 NO 18, 64" duplex with numeral "21" vertical oval on cover to New York N.Y., red crayon "8d" credit to G.B., red London Paid (1.11) transit cds and matching "16/Cents" credit handstamp, "N.York Br. Pkt. '5' Jan 28" integral-due cds and "Due" handstamp with pencil "5" cents due rating; right stamp faulty, a Very Fine use. Scott No. 29B. Campbell Paterson No. A5f (X). SG No. 108 Estimate $400 - 600. 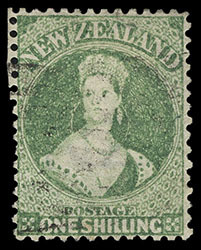 New Zealand, 1864, Queen Victoria "Chalon Head", 1s yellow green, perf 12½, N Z watermark, well centered with light barred oval cancel, small tear at top, rare and Very Fine appearance, Major Henry Dumas, Spink, March 2000, lot 192; with 1938 R.P.S.L. certificate. Scott No. 30B. Campbell Paterson No. A6h (V). SG No. 109 £2,750 ($3,610). 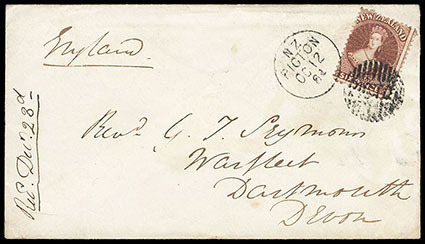 ONE OF LESS THAN 10 RECORDED EXAMPLES OF THE 1864 1S YELLOW GREEN PERF 12½ ISSUE.